Cardio After Leg Day – Good Idea or Bad Plan? Best Home Gym Equipment Reviews Cardio After Leg Day – Good Idea or Bad Plan? Leg Day – it’s the day we all dread. We know we have to do it, but we know it’s going to challenge us to the max, both physically and mentally. Our quads are going to quiver, our hamstrings are going to hurt, and our glutes are going to groan. If we do it right, we won’t walk out of the gym – we’ll stagger out. And then we’ll be in agony for the next 5 days. For many, the very idea of exercising your legs the day after leg day is a joke. If you can’t even sit down on the toilet without your quads aching, what hope is there of jumping on the treadmill? Makes sense to just skip that cardio, right? Well, not so fast. 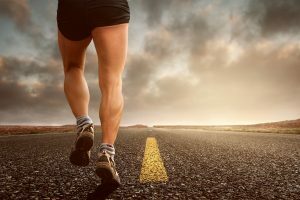 Some recent research actually seems to indicate that doing cardio after leg day may actually speed up your post workout recovery. Let’s investigate. Leg day is the day of the week that is dedicated to training your legs – that’s your quads, hamstrings, glutes and calves. In order to stimulate these muscle groups, you need to lift heavy with basic compound movements. One reason that you have to go heavy on your legs is that they are already used to carrying around your body weight all day long. They’re also being constantly used, whether you’re walking around or riding your bike. When you’re in the gym, your goal is to place stress under muscle fibers to the extent that those fibers are broken down. Then, your post exercise recovery and re-feeding is meant to build them back up again. But, that will never happen unless you place a heavy load on your legs. Two of the most basic, and hardest, compound exercises should form part of your leg routine. These are the squat and the deadlift. Go heavy on these exercises and your legs will be on fire. Follow them up with the likes of lunges, leg extensions and goblet squats and it’s no wonder that you’ll be dragging your way to the car. As we’ve already mentioned, muscle doesn’t grow when you train your legs. When you’re done in the gym, your legs are at their weakest and smallest. It’s only when you rest, recuperate and feed your muscles that they will be able to grow back bigger and stronger. If you fail to give your muscles time to recover from a workout, the microfiber tears that have occurred as a result of your training session, you will stay in a catabolic state. To build muscle you need to be in an anabolic state. The conventional wisdom states that you need to rest a muscle group for 72 hours before training it again. In other words, if leg day is on Tuesday, you shouldn’t even think about hitting them until Friday. Even though this relates to resistance training, most guys include cardio on their no-go after leg day list. A study out of California State University, Fullerton, separated participants into three groups. All three groups performed a leg workout that induced DOMS (delayed onset muscle soreness). The first group did moderate intensity cardio exercise on a stationery bike for 20 minutes the day after the leg workout. The second group did low intensity cardio while the third group did not cardio at all. The group who performed the moderate intensity cardio had an increased level of blood flow to the trained muscles. This resulted in greater nutrient supply to the affected areas, as well as a faster tracking away of waste by products, including lactic acid. The consequence of these actions was a reduced level of DOMS and a faster recovery among the moderate intensity cardio group. On the basis of this study, many trainers are now recommending that, no matter how sore your quads may be, you will recover faster by pushing yourself to do a twenty minute session on the stationery cycle the day after your leg session. This makes a lot of sense. The pain that you feel in your quads hamstrings, glutes and calves the day after your leg training day is your body’s way of communicating with you that you have overstressed the muscle fiber and that it is in need of repair. Contained in your blood is everything that you need to repair the muscle (supposing that you have been taking in the right nutrients like lean protein and healthy fats). Cardio exercise will speed up the blood flow to the muscle cells. So, it makes sense that doing moderate cardio will help the healing process. Something else that will assist in post leg day healing is stretching, and activity which also increases blood flow. Stretching, however, should never be done cold. The best idea is to engage in some leg specific stretching directly after your cardio. This doesn’t have to be extensive – just do a couple of dynamic stretching moves like bodyweight squats and leg lifts and a couple of isometric stretches such as a hamstring / quad stretch and a calf stretch. What you’re actually doing when you perform some moderate cardio the day after your leg workout is what the fitness professionals called active recovery. It involves doing some light to medium intensity non- resistance related cardio in order to relieve DOMS and speed up workout recovery. Other forms of active recovery that you can do apart from spending twenty minutes on the stationery cycle are working out on the elliptical, stepper or simply going for a 20-minute walk around the block. Active recovery can also involve playing sport. Getting yourself down to the court for some hoops will probably be more enjoyable than sitting on an exercise bike – and it will help to ease the pain in your quads. Swimming is another great choice as a means of active recovery. 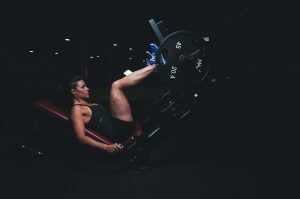 As we’ve seen the key reason that you’d consider doing cardio after leg day is to relieve the delayed onset muscle soreness that you are experiencing. So, what else can you do to reduce the effect of DOMS? Here are two additional things that will ease the pain . . .
Self Myofascial Release (SMR) involves using a foam roller to self massage the areas of your body that are experiencing delayed onset muscle soreness. A foam roller is a PVC cylinder that your place between your body and a solid surface such as the floor or a wall and roll up and down on to get deep into the muscle tissue. 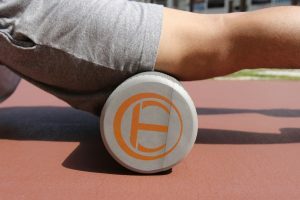 You can get foam rollers that have protruding nodes that allow you dig into and penetrate your areas of muscular pain. Self myofascial release has been shown to . . .
SMR softens the fascia tissue which connects structures within the body. The fascia tissue is bathed in a ground substance. When you are experiencing DOMS, the substance is thick and gelatinous. Foam rolling turns it into loose fluid, helping to relieve your pain. SMR kneads the muscle tissue, improving the long-term quality of the muscle and reducing future DOMS. The best way to knead the muscle is with long, slow, sweeping movements. SMR numbs pain trigger points, which are the areas where the pain and inflammation builds up. Short, concentrated repetitive movements are the best way to numb trigger points. 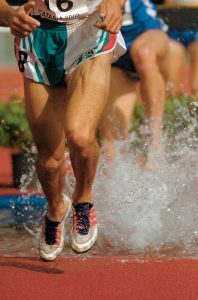 SMR breaks up the minor scar tissue which can often result from hard out leg training. Self massage can allow you to break up the scar tissue and lessen the associated pain. There have been a number of studies that have provided research backing to the efficacy of performing self myofascial release to relieve DOMS. You know that you should be drinking water during your grueling leg day workout. However, it is just as important to keeping up the H20 intake once you’ve left the gym. With more water, every system in your body will function better. With more water, your blood courses through your veins faster, helping nutrients get to your muscles faster and more quickly removing waste products. Water allows all of your bodily function to work more effectively. It will allow for a faster and more effective uptake of nutrients, allowing you to get essential amino acid into the muscle cell faster. How do you know if you’re drinking enough water? Just check your urine. Ideally, it should be clear. To ensure that it is, set your goal to consume 84.5 oz (2.4 L) each day. It should be almost clear. If it’ a dark yellow color, you need to be drinking more – aim for 84.5 ounce (2.4 L) per day. Doing any sort of cardio the day after an intense leg workout may sound crazy, but there is a method in the madness. The reason to do it is to bring relieve from the pain and speed up recovery. Spending a relatively easy twenty minutes on the exercise bike will, in the long run, be good for you.